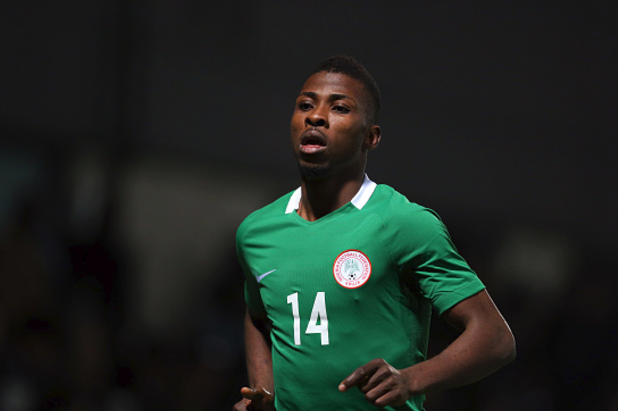 Kelechi Iheanacho will play no part in the Super Eagles friendly game against Serbia in London on Tuesday it has been confirmed. Toyin Ibitoye, the Super Eagles Media Officer revealed that Iheanacho has a fractured hand which is presently in a cast but he was quick to douse tension on any long term injury for the Leicester City forward. "Iheanacho is not going to play the Serbia game because he is injured, he has a fractured hand but nothing serious, he was still able to train with it but we don't want any contact that is why he would not be dressed for the Serbia game" Ibitoye explained. It is expected that Iheanacho will get full diagnosis when he returns to his Premier League club. Aside from Iheanacho, another Super Eagles player that will be missing owing to injury is Shehu Abdullahi who could not finish the Poland game and was replaced by Tyronne Ebuehi. The Super Eagles will play their second friendly in four days on Tuesday against Serbia at the Hive, London by 8.pm.